Returns a generic CSS class name for a disabled element. Returns a generic CSS class name for an active element. Returns whether the theme allows for an anchor to be styled as a button. Applies a style that indicates the result of validation. Abstract base class for themes in Wt. Applies the theme to a child of a composite widget. The widgetRole indicates the role that child has within the implementation of the widget. 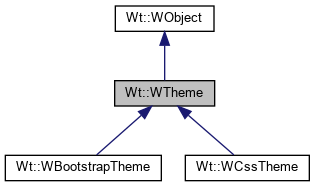 Implemented in Wt::WCssTheme, and Wt::WBootstrapTheme. Applies the theme to a DOM element that renders a widget. The element is a rendered representation of the widget, and may be further customized to reflect the theme. Returns a unique name for the theme. This name is used by the default implementation of resourcesUrl() to compute a location for the theme's resources. Returns the URL where theme-related resources are stored. The default implementation considers a folder within Wt's resource directory, based on the theme name(). Serves the CSS for the theme. This must serve CSS declarations for the theme. The default implementation serves all the styleSheets(). Returns a vector with stylesheets for the theme. This should return a vector with stylesheets that implement the theme. This list may be tailored to the current user agent, which is read from the application environment. Returns a generic CSS class name for the chosen role.